Comments : I just bought and transported a 2 year old female Bull Terrier from Hell of a Bull. I dealt with Bec and found her and Hell of a Bull to be fantastic. They were very helpful and great to deal with. Bec has been a wealth of information and has stayed in touch since "Winnies" move to Perth. Bec obviously loves and cares for all her dogs very much and only lets them go to suitable people. 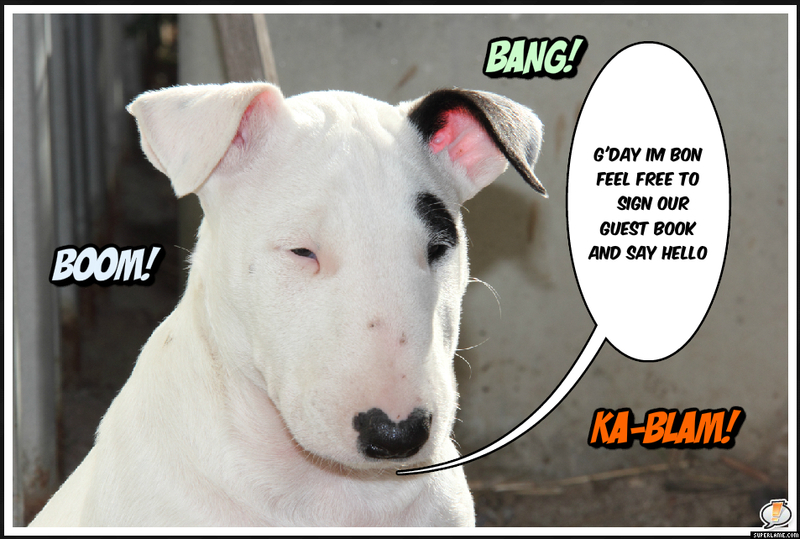 I love Bull Terriers and although I never Winnie before she arrived she is just as Bec described her. I am very happy and hope to use Hell of a Bull for my next Bully. Comments : Congrats on your best in show with your young boy. Comments : Beautiful bullies. Would love to get another for my children after losing ours earlier in the year. Comments : A huge congratulations on Runner Up In Show with the beautiful Hellofabull Royal Bliss. Many more wins to come. Comments : Beautiful looking bulls! Had a bullie as a child, so when I see one I get a tear in my eye. Would love to have another bull to share my life with my children! So lovely to see and know that people like yourselves are doing this noble breed justice! Stunning. Comments : Pam told me of your site, my daughter and I love bullies and are looking at buying a couple in the future. Talk then, keep up the photo's, love them, they are darlings. Comments : hi i have the half sister to flick . same father ( evildouer kung fu pander ) flick is a great looking bully. good web site. Comments : WOW WOW WOW! I know I have said this before but your dogs are Stunning Bec. Congratulations they are a credit to your hard work. Comments : Congrats on your first litter...12 WOW what a great start. Comments : it was great to meet u...see u next time i come downthere! Comments : Love your website Bec & Bill.Keep up those great photos!